In cases of high hydraulic loading, the trickling filter may be operated as a flooded bed and the pressure differential needed for the downwards flow increases. The level of wastewater necessary to overcome the flow resistance depends on the form of the substance used as support material and the thickness of the biofilm. Aerobic fixed beds must be aerated near the bottom, producing a two-phase flow in a three-phase system with an upwards air flow. As a result of friction forces, water is transported upwards in the center of the reactor and flows downwards near its walls. Biomass is attached at the surface of the support material and is also suspended as flocs. It is not easy to avoid blockages in regions of biofilms with a higher thickness and a lower local flow rate. The fixed bed must be cleaned from time to time by considerably increasing the wastewater flow rate. Synthetic support materials such as BIOPAC (ENVICON, Germany) have been used successfully, especially where nitrifying bacteria with lower growth rates must be immobilized (Fig. 7.3). In contrast to fixed beds with solid particles, the flow of water and air are more easily controlled and blockages can be avoided in reactors with suspended particles. In contrast to trickling filters, their air flow rates can be adjusted to match the loading of organics and ammonia. 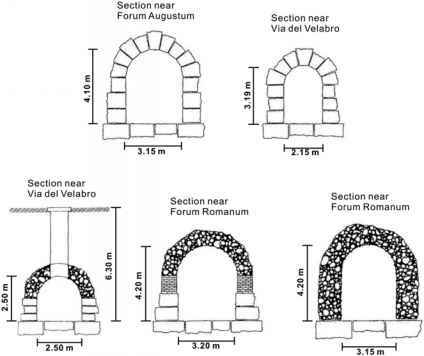 The specific surface area can be increased to up to 400 m2 m-3 (Schulz and Menningmann 1999). Using membrane-type tubular aerators, fine bubbles are produced and the mass transfer rate is increased remarkably. The suspended biological sludge detaches from the surfaces as a result of the friction forces of the flow and is conveyed to the secondary settler. Obviously, blockages do not occur. Table 7.2 presents some operational data. Fig. 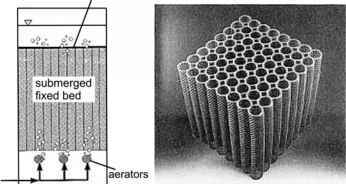 7.3 Submerged aerated fixed bed reactor (a) and BIOPAC (b) (ENVIRON, Germany; Schulz and Menningmann 1999). Comparing the loading per volume with that of trickling filters (Table 7.1), we can conclude that in this kind of fixed bed reactors the loading can be increased by a factor of three for intermediate and high-rate systems and by a factor of five for super-high-rate systems. This is due to the higher specific surface area of the biofilm and the technological advances which prevent clogging in the BIOPAC system, for example (Schulz and Menningmann 1999). Table 7.2 Load, biofilm thickness and application of the BIOPAC system (Schulz and Menningmann 1999). a) Specific surface area a = 100-400 m2m 3, here assumed a = 250 m2m 3 (Schulz and Menningmann 1999).